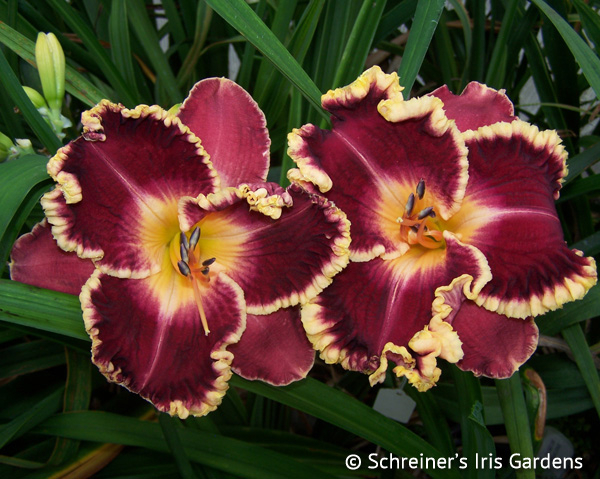 Daylilies are Easy to Grow! Plant them soon after you receive your order. Daylilies do not like to dry out. Keep them in a cool area until you are ready to get them in the ground. Full Sun is best. Dappled sunlight is good too. Plant in nutrient-rich, moist, well-drained soil. Mulch with compost and organic mulch to retain water and discourage weeds. Fertilizer regularly with a balanced fertilizer, either liquid or granular. Water is a must. Water every 3 days during the dry season; drip irrigation works great. End of the season: remove all dead and dying foliage and pull the old bloom stalks. Leave the healthy foliage for winter protection. Divide after 3 to 4 years. Water the clump well before digging. Dig the entire clump and knock off any dirt on the roots. Cut back foliage to 8 to 9 inches. Now take something similar to two large screwdrivers and pry them into the center of the clump and break into single or double fans. Cut off any damaged roots and you are ready to replant. Plant them about 3 feet apart for they may become 24 inches in diameter. Mulch heavily between clumps for the best weed control. It is evidenced with tiny mustard yellow spots forming primarily on the underside of the foliage. It is spread by spores in the air and some varieties are significantly more susceptible than others. Initially daylily rust was quite prevalent in Florida, but rare elsewhere. Due to its transmission vector and the high rate of susceptibility of daylilies to rust, it is now endemic throughout the United States in areas without a hard winter freeze or an area with no perceptible humidity. This means that desert environments like Arizona and areas as cold as Kansas and Missouri should not have rust winter over. In areas with mild winters it may be a moderate or severe problem and in tropical areas with lots of rainfall, it may be severe. We offer the following suggestions to help our customers prevent an infection of rust. First, be able to recognize it. Be sure you know what rust looks like and inspect your plants regularly for traces of it. If you find rust, cut the foliage back to about 3 inches and spray with Daconil Ultrex. This will kill any active spores. This may solve the problem, but you need to revisit this area each week and make sure it's under control. If you have an organic garden and are opposed to spraying, we would recommend you remove any cultivars with significant rust and unless you live in a very tropical environment, you may find the rust while active in your garden, is not objectionable. Be considerate of others though and don't share or sell any plants without informing them that you do have active rust in your garden. We recommend that you buy from nurseries that have active spray programs and sources to minimize your chances of getting rust. To learn more about rust, we recommend you visit this website to learn more about daylily rust. http://www.ncf.ca/~ah748/rust.html. 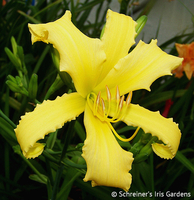 Other common pests of daylilies are spider mites, aphids, and thrips. They can also be easily controlled with a regular spray routine. Some areas of the country have problems with crown rot and winter freeze damage. In mild climates, you should not have problems with either of these.